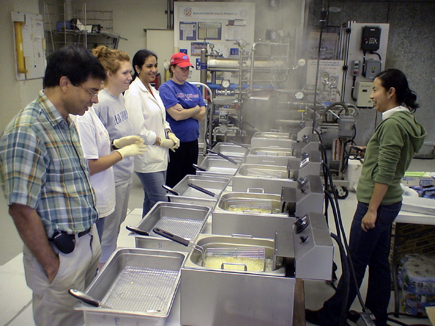 Dr. Alam and members of the Texas A&M project team frying French fries. Dr. Alam is the head of the Fats and Oils Program of the Food Protein R&D Center at Texas A&M University. Each oil is used to fry French fries up to 300 times over 13 frying days to determine which oils have the longest fry lives. One of the oils is a leading brand of partially hydrogenated soybean oil which is included as a control. The others are zero trans fat oils. FryTest.com purchased five tons of frozen French fries for the testing of the first ten oils. French fries produce fully valid and reliable data for other foods such as chicken and fish. See the FAQ page. The project leader, Dr. Alam, weighs oil as he pours it into a fryer tank. The oil is weighed so that the oil usage rate can be determined. This tells us how much oil is being absorbed in the food and how much makeup oil is being used. Checking the temperature of the oil. Digital measurements are also taken regularly to determine Total Polar Materials (TPM). TPM is the best measurement of fry life when combined with the findings of a trained panel. Taking an oil sample for lab testing. Lab testing is performed to determine fat content. Restaurants need to know the types and percentages of fat if they wish to provide nutrition information to customers or if they need to satisfy existing or future labeling requirements. Lab testing is also used to confirm TPM which is an indicator of fry life. "Taste is king." 49 consumers waiting to taste five sets of fries and deliver their verdicts. The fryers are just a few feet from where the consumers are waiting. The fries are served in preheated cups to preserve the heat. The consumers are not told what oils they are sampling. The consumers are asked to assess the fries based on appearance, color, flavor, crispiness, greasiness, and overall liking. The trained panel in action. They are specially trained to detect off-flavors and off-odors as the oils degrade after extensive frying. The panelists do not know the identities or types of oils that they are sampling. They meet eight times to assess changes in the oils. It takes ten fryers to test five oils. That's because the trained panel compares fries cooked in later batches with fries cooked in fresh oil. The purpose is to ascertain if the oil has changed after extensive frying.